Our regular business hours are Mon-Sat 10AM-5PM, although someone is often here until 6. If you think you might come after 5, give us a call at (617)277-8690. 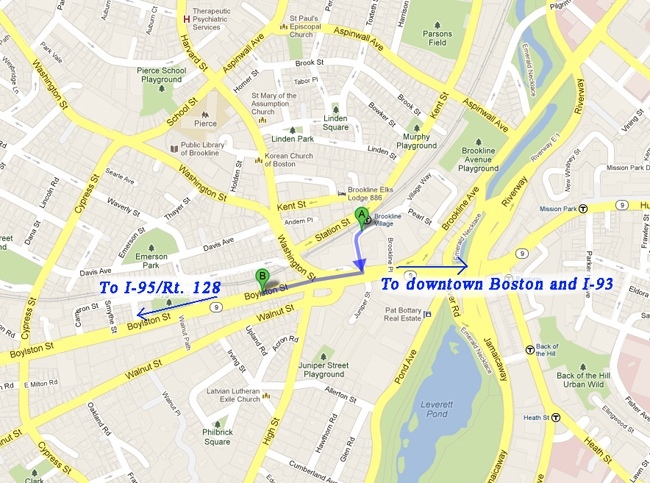 We're conveniently located near the Brookline Village T stop (letter A on the map below) on the D line of the Green Line. Our location is at letter B. Our shop is on the westbound side of the street. If you arrive by car, you can park in the gravel driveway just before you get to our building (the Early Music Shop is the house with a little front porch) or on the street in front of the shop.